Research and Development (R&D) is a key competitive advantage for Enerkem. Only through R&D is Enerkem able to set a new global standard in waste management, biofuels and chemicals and be at forefront of the Circular Economy. 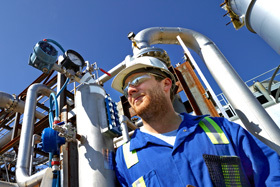 With a dedicated innovation center in Quebec and an affiliated research facility Alberta, Enerkem has one of the most capable R&D networks of any waste-to-biofuel company. The company’s research and innovation network, employs over 20 people and leverages numerous others through University and other research partnerships. Enerkem research and engineering to date has resulted in 22 patent families, over 100 international patents, and countless innovative breakthroughs since the company’s inception in 2000. Beyond waste-to-biofuel, the future of the bioeconomy will increasingly be driven by science. Enerkem researchers and scientists are looking ahead at waste management processes, as well as the biofuels and green chemicals of the future. Developing products beyond methanol and ethanol that add value to recycled and renewable carbon by addressing new product markets: jet fuel, acetic acid, acrylic acid, etc. R&D is also critical in ensuring regulatory compliance of all Enerkem products. Enerkem is able to test and develop new products safely and efficiently by complying with regulatory affairs in all its R&D activities, from start to finish. For more the latest Enerkem news and developments, please visit the Newsroom.